Despite being born In New York, Rikky von Opel was the first, and to date only, driver from Liechtenstein to have raced in F1. Independently wealthy - his family founded the Opel car maker - he funded and drove for the Ensign team in 1973 after winning the British Formula Three Championship the previous year. He was a decent driver rather than just a rich kid, and when the car held together, which was not often, he put in decent performances. 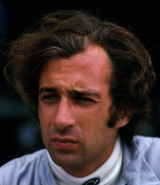 Mechanical issues at the opening race in 1974 led to Opel giving away his shares in Ensign and switching to Brabham as a pay driver at the start of the European season. He managed two ninths but promptly quit after failing to qualify for the French Grand Prix and walked away from the sport. At the start of his career he used the pseudonym Antonio Bronco to avoid his disapproving family finding out he was racing.